Urban myths abound regarding kit homes, as people search for problems to rule them out of their new home equation. 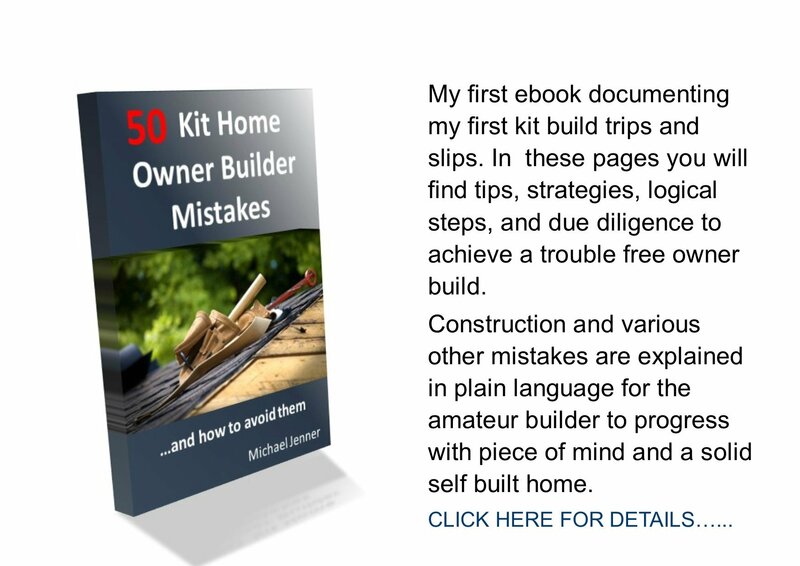 Over the years I have fielded many questions from budding owner builders, desperate to understand how a kit home can possibly compare with a normally built home. Most of the problems they find are misconceptions, while some are outright scaremongering. That's not to say kit homes are perfect, but there are many players out there who would like to see this form of housing go under. So let's start with the most notable urban myths. 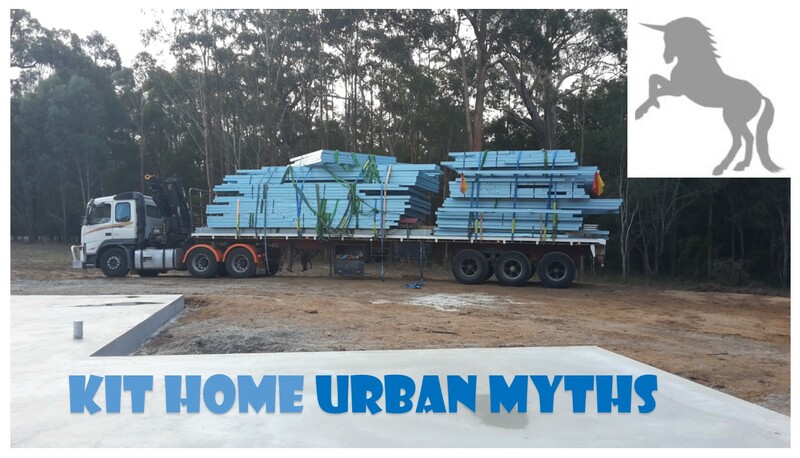 To start with, kit home materials arrive on site, exactly like normally built home materials do. In both cases, frames are pre-built and transported to the site on a truck. No longer do carpenters slave away constructing frames on site. Windows are supplied by glaziers, pre-assembled with fitted reveals. The rest is supplied in bulk and requires the usual measuring and cutting. This is the case with kits and traditional builds. That is, cladding, roofing, wall linings, doors, jams, arches, skirts, doors, etc all need installation and are not pre-cut, except in the case of some pre-hung external doors. If an owner builder is constructing the kit home, the finished product will be determined by the OBs project management, and the ability and commitment of the employed tradesmen. Most 'builders' will do a good job, but some don't, and not all OBs have the goods either. In the end, it's all about planning and workmanship, not whether or not it is a kit home. 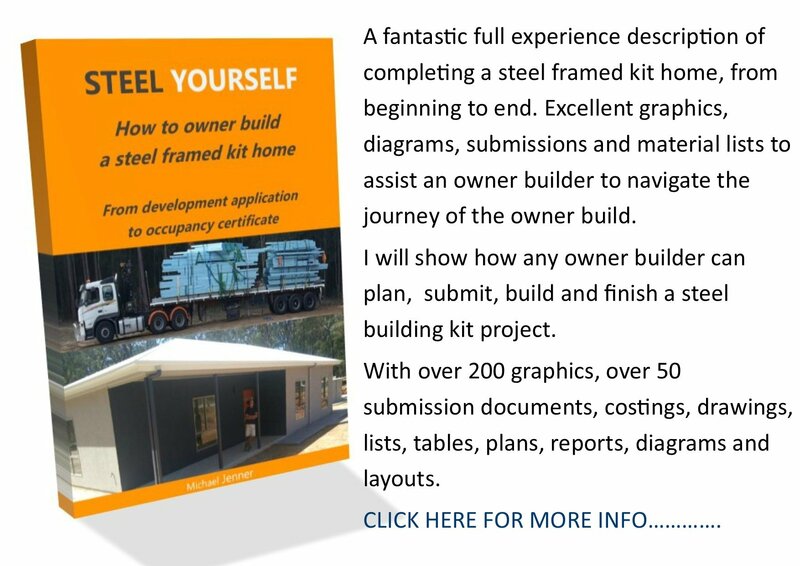 Steel frame thickness, heavier tie down, truss or panel roof structure, cladding/brick/block, roofing iron or tile, internal fittings...all go into how a kit home will be evaluated by others. Check my Inclusions Page here. Urban myths such as this are complete misinformation. In fact all homes are made this way to reduce cost: it's all about economics and not specifically about kit homes. It is unlikely, with today's engineering standards, and modern fastening methods, that engineeering would be sub-standard. Both are superior products only because they are built under factory conditions. But, pre-fabs are expensive and twice the cost of kits as they are pre-built, for easy assembly. They are easy and fast to construct as walls are panelized, roofs have interior and exteriors, and many have flat-packed kitchens, bathrooms and laundries. Modular homes are even more expensive: three times or more than kits, as they are fully built, including internals, and transported in large sections to the site. Kit home designs can start with liveable sheds, but progress through to granny flats up to two storey, multi-bedroomed, multi-bathroomed, multi-living area homes. They can be cookie cut 3 bedroomed homes, log homes, post and beam, barn style, yurt, steel, wood, bunker look (RAL), geodesic, octagonal.....I have expanded on these styles here. So, now that you have the background you can see how kit home urban myths are generated...basically from ignorance of the product.